Because just when you think your marriage is safe from adultery is when you may be the most vulnerable. With eye-opening stories, clinical insights, and up-to-date data, Dave reveals what adulterers learned the hard way- and want the rest of us to know. Close Calls should be on every church leader’s and marriage counselor’s required reading list. Includes charts and assessments. The revised versions of Torn Asunder and the Torn Asunder Workbook are available at www.Amazon.com. 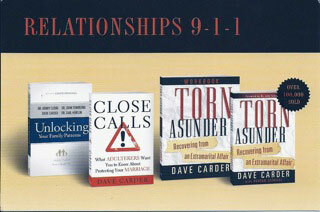 Torn Asunder has helped over 100.000 couples since it was first introduced in 1991, and continues to be the most frequently chosen, faith based resource available.